Downed power lines are a serious emergency and should be reported immediately by calling Memphis Light, Gas and Water's 24-hour Emergency Hotline at (901) 528-4465. 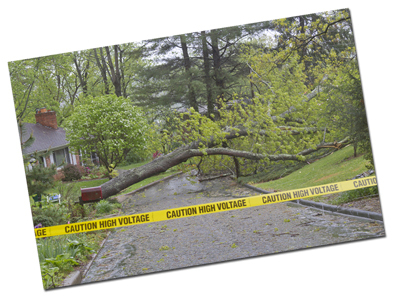 Never, under any circumstances, go near a downed power line or anything that is in contact with the line. It is very possible that the line could be energized, and there is absolutely no way for you to tell the difference. Remember, too, the line can become energized at any time. If you are in a vehicle that hits a pole and wires fall on your vehicle, stay inside and ask someone to call 911 for fire and police rescue first, then MLGW for assistance. Unless your life is threatened by severe injury or fire, you should remain in your car until an MLGW representative tells you it is safe to leave. If you must leave, however, jump completely clear of the vehicle, never touching the vehicle and the ground at the same time. Land with your feet together and be careful to maintain your balance. Again, to report an emergency such as a downed wire, an extremely low wire or one that is sparking, call MLGW's 24-hour Emergency Line at (901) 528-4465.